Happy Thursday! Do you want you to hear the craziest thing? In last week's post, I wrote about how I really wanted to make a bunch of lasagnas for the victims and first responders of the wine country fires. I wrote that on Monday and then on Wednesday I found out about an amazing lasagna drive being organized by Confetti Kitchen, where they would be doing exactly that. I signed up instantly and I'm so unbelievably happy that I did. It took place in the gorgeous space of Cookhouse SF. I felt like I was walking into a dream. The kitchen was like out of a provincial french cooking show and all the other chefs and volunteers were so kind. I was a little nervous at first that it was going to be a bunch of professional chefs and then ... me. But it was fine! Everyone was friendly and so talented! I wish I could talk about food with other chefs all day every day! By the end of the day we ended up cranking out 50 delicious lasagnas. They made their way out of the kitchen and into the bellies of some really deserving people. Hopefully the cooler fall weather and maybe some rain will provide some relief up there. I think we could all use some relief right now, and Fall is the perfect season for it. Don't we all become a little basic when Fall comes around? Like, we can't help. Who doesn't like crisp air, cozy sweaters, soft flannel, warm spices, the return of This Is Us, and finally being able to turn our oven on or stand over a hot pot of soup again? I freakin' love it and I don't care if you think I'm basic because of it. I feel like I can be my TRUE self during the fall. It's finally socially acceptable to be wrapped up in a blanket at all times. Apple cider is constantly stocked in our fridge (FYI, Reuben finally bought a beer fridge and there is sooooo much room in the fridge now!). The temperature outside makes me crave noodle soups, which is my favorite food group. Then there is all the orange! If you haven't noticed or don't know me very well, orange is my absolute favorite color. It is just such a bright and cheery, yet calming and warming color. I feel like not enough people love the color orange... but that just means more orange KitchenAid stand mixers for me! Is it a coincidence that my favorite color is abundant during my favorite season??? IDK. But I'm happy that it is! I tend to buy things more if they are a beautiful hue of orange, like persimmons, sweet potatoes, oranges, tomatoes, carrots, peppers, mangoes, you get the idea. You should have seen me at the farmers market this weekend... so. many. orange. things. It is only natural that I try to make my meals orange too! I took my most comforting cozy meal, Ginger Chicken Jook, and made it all Autumn-y! If you haven't had jook or congee, it is a rice porridge-like soup and one of my favorite foods. It's also a meal that takes a bit of patience to prepare. You need about an hour of peacefully stir rice. This is a great time to call your mom though! Call your mom. 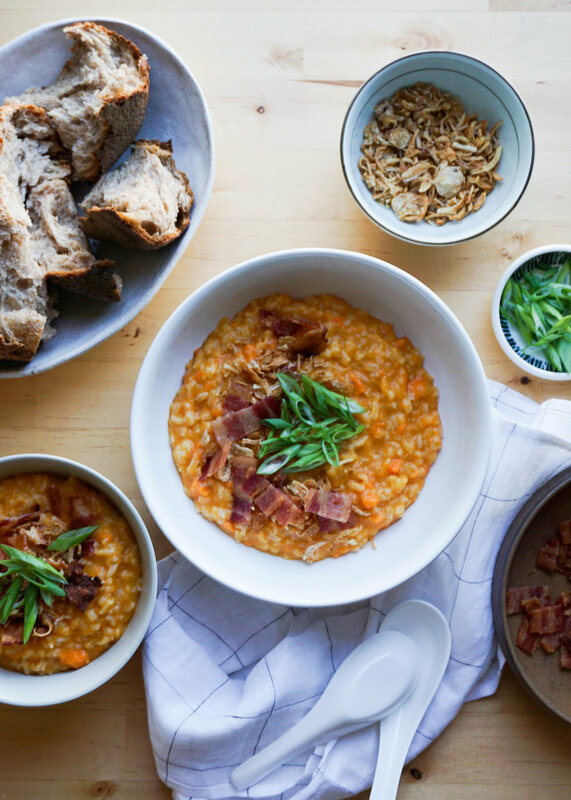 The sweet potato makes the jook really earthy and hearty. It's like a sweet potato or butternut squash soup but 10 times better and more texturally interesting. You can add all sorts of toppings, an egg even! I added green onions and fried shallots, which are classic toppings, some bacon for some smokiness, and torn up some pieces of sourdough rye bread from the farmers market for dunking. I ate my bowl while wrapped up in my blanket and it was the best! 1. Fill a large soup pot with 8 cups of water. Bring to a boil and add in the peeled and chopped sweet potatoes. Boil the sweet potatoes for 20 minutes, until soft and tender. Use a slotted spoon or fine mesh sieve to scoop out the sweet potatoes and place aside in bowl. Use a potato masher or a large fork to mash the sweet potatoes. You still want a few chunks for texture. 2. Add the chicken start to the remaining water and bring back to a boil. Slowly add in the rice and give it a good stir for 15 seconds. Add in grated ginger and oyster sauce. Season generously with salt and pepper, add more to taste as it continues to cook. Allow the rice to cook at a simmer for 30 minutes, stirring every 5 minutes so that the rice doesn't burn. 3. After 30 minutes, add in the mashed sweet potatoes and give it a good stir. Boil for another 20 minutes until the jook has thickened and both the rice and sweet potatoes have broken down. If it gets a little two thick, add a cup or 2 of water. 4. Once the jook has thickened, allow it to cool to a safe eating temperature. Serve in soup bowls and garnish with sliced green onions, bacon, and fried shallots! Or whatever your hearts desires!